Earthen berms that serve as backstops for 67 shooting stations will be higher, more level and — most important — safer. Target bumpers (which hold up the target frames) with re-stenciled lane numbers. In order to complete more than $100,000 in improvements, the main range will be closed to the general public Aug. 14-29. The projects will be paid for through funding from the Wildlife and Sport Fish Restoration Program (WSFR). The Arizona Game and Fish Department does not receive general funds from the State of Arizona. “While this work is going to inconvenience some folks, due to the extended duration of the closure, the work on the range is necessary to maintain the highest levels of standards of safety and stewardship that our customers have come to expect from the facility,” said Christopher Dean, range manager. The two-week closure also will apply to the adjacent specialty ranges designated for user groups – Smallbore, Rifle 2 (which also will see improvements to its berm), Pistol 3 and Pistol 4. Located on 1,650 acres in north Phoenix, the Ben Avery Shooting Facility is one of the nation’s largest publicly-operated shooting facilities, drawing more than 120,000 shooters each year. 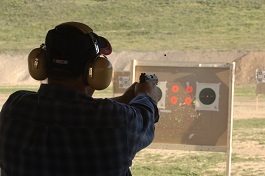 A City of Phoenix “Point of Pride,” the facility has received a five-star rating from the National Association of Shooting Ranges. For more information, visit www.azgfd.gov and click on “Shooting,” or call (623) 582-8313.